There isn't an artist in history who didn't draw inspiration from the creative giants that preceded them. Being exposed to (and studying) the work of past and contemporary masters is a critical step in any young artist's growth. By analyzing great artwork you begin to form an idea of what works and what doesn't. It's one of the easiest (and most enjoyable) ways to learn some of the basic tenets of composition, lighting, and design, and it also happens to be a pretty great way to unwind at the end of a hard day! And while looking at pretty pictures isn't going to teach you the technical side of CG, it will help you make the most of your tools and software. There's no substitute for good, solid practice, but these artists' portfolios can be an incredible source of inspiration, reference, and motivation. Before we get to the guys who are working in CG today, here are (just a few) of the men that have helped shape entertainment design into what it is today. There are certainly omissions but this is a good starting point if you want to brush up on your history. Will Eisner & Jack Kirby - Perhaps the important progenitors of the comic book genre. Frank Frazetta - One of the greatest fantasy painters of all time. Certainly the most famous. 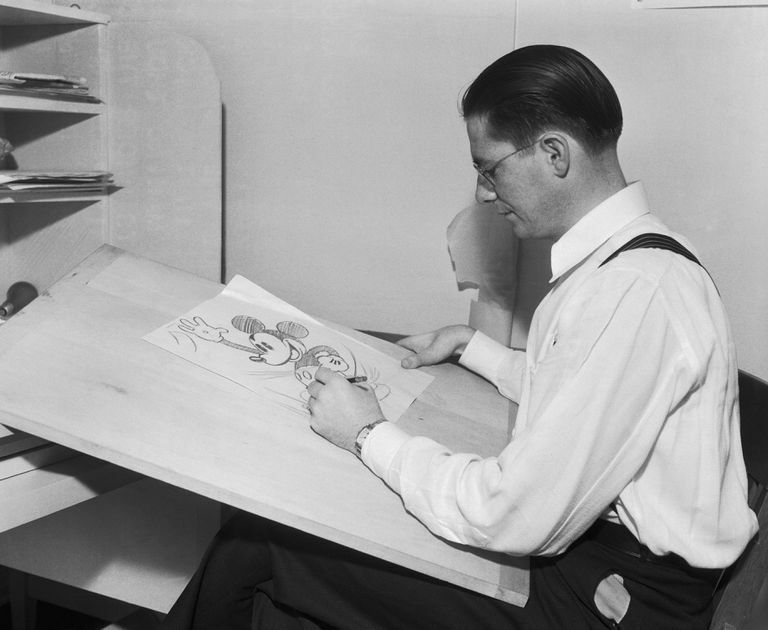 Frank, Ollie & The Nine Old Men - The legendary animators of Disney's golden age. Jean "Moebius" Giraud - One of the most imaginative visual minds that's ever walked this Earth. Syd Mead - Blade Runner & Aliens—what else is there to say? Oh yeah, he's probably the greatest futurist illustrator of all time. Ralph McQuarrie - The man that designed Star Wars. It really doesn't get any more legendary than that. Stan Winston - The god of makeup and monsters. This list reflects an interest in environmental design pretty strongly but it's still worth exploring if your own interests differ. Adam Adamowicz – Recently deceased Bethesda concept artist behind Skyrim and Fallout 3. He had a style all his own. Noah Bradley - Environment artist with a knack for dramatic lighting. Ryan Church – Environment & Vehicle design. James Clyne – Mechanical and environment design. Dylan Cole - Another top-tier environment artist. Thierry “Barontierie” Doizon – Generalist, very painterly. James Paick – Environment design. Dave Rapoza - Character artist with rendering skills right up there with Frazetta himself. Scott Robertson – Industrial design, vehicles, mechs. Andree Wallin - One of my favorites. Mostly environments and mattes. Feng Zhu – Absurdly prolific environment master with a cool, loose style. Alex Alvarez – Creature sculpture, founder of Gnomon, and one of the men directly responsible for the wealth of good online CG training we enjoy today. Allesandro Baldasseroni - His piece, "Toon Soldier" is wonderful. Pedro Conti - Really fantastic stylized work. Marek Denko - One of the reigning gods of photo-realism. Cesar Dacol Jr – Creature Sculpture. Joseph Drust - Insane hard-surface ZBrush stuff. Scott Eaton – Classical anatomy sculpture, ecorche. His anatomy style is probably my favorite in the industry. Tor Frick - A low-poly/optimization master. Recently made waves, creating an incredible game level with a single 512px texture sheet. Hanno Hagedorn - His work for Uncharted 2 is mind-blowing. Andrew Hickinbottom - CG pinups galore! Kevin Johnstone - Extraordinary Gears of War environment artist. Ryan Kingslien - Anatomy instruction. Stefan Morell - His industrial environments are stellar. Also, he's a pretty great texture artist. Neville Page – Concept sculpting/character design (Avatar, Tron, Star Trek). Scott Patton – Concept sculpting/creature design (Avatar, John Carter). He and Neville pretty much paved the way for ZBrush as a design tool. Victor Hugo Queiroz - One of the best toon modelers out there! Wayne Robson – Mudbox master, environment artist, plugin writer, and FXPHD instructor. Jonathan Romeo - Really lovely character work. Rebeca Puebla - Stylized models rendered really realistically. Jose Alves de Silva - Also one of the best toon modelers out there! (Seriously, it's impossible to choose between these two guys). Manano Steiner - His Richard McDonald study from a few years ago is one of my favorite ZBrush pieces ever. Max Bertolini - Fantasy illustration, very much in the vein of Franzetta. John Brown – Maquette sculpture. James Gurney – Fantasy Illustration, Creator of Dinotopia, and author of two very good art books. Stephen Hickman – Fantasy & Sci-fi Illustration. John Howe - See above (Lord of the Rings). Alan Lee – Fantasy illustration, key Lord of the Rings designer. Richard MacDonald – Wonderful, wonderful classical sculpture. Jean Baptiste Monge – Whimsical fantasy illustration. Jordu Schell – Traditional maquette sculpture/mind-blowing.